The largest single-site cancer centre in Europe, treating 44,000 patients per year and servicing a population of 32 Million people. The Christie was the first UK site to be accredited as a comprehensive cancer centre and currently treats patients from across the region. It attracts national and international professionals and forms a key part of developing cancer expertise in the UK. The Christie is the largest single-site cancer centre in Europe, treating 44,000 patients per year and servicing a population of 32M. The story of The Christie begins in 1887 with Sir Joseph Whitworth’s gift of land to Richard Copley Christie in his will. In 1901, this institute was renamed The Christie Hospital, and was the only hospital outside London specialised in and dedicated to the treatment of cancer. The Christie was also the only hospital outside London active in pathological research at that time. The Holt Radium Institute, developed from the research of Dr Robert Biggs Wild and the input of Ernst Rutherford himself, joined The Christie at a single site in 1932, where the hospital remains to this day. It was the first UK site to be accredited as a comprehensive cancer centre and currently treats patients from across the region, as well as patients from across the UK for some specialist radiotherapy treatments. The Christie operates 12 linear accelerators across all 3 of its current sites, with plans in place for further expansion in the coming years. In addition to radiotherapy offer, The Christie is the UK’s largest chemotherapy unit, delivering services at Withington but also 10 other sites, with a mobile chemotherapy unit and outreach services that are delivering chemotherapy in patient’s homes. Specialist surgery for complex and rare cancers is also a core part of the services currently offered. A wide range of support and diagnostic services are also offered to patients to provide first-class experience to every patient. Today, The Christie NHS Foundation Trust has an annual turnover of £230 million, and operating with 2,500 staff, 300 volunteers, 30,000 public members and one of the largest hospital charities in the UK. The Christie School of Oncology is a world class teaching centre, bringing together professional and pre-registration education, plus continuing professional development activities into one structure. It attracts national and international professionals and forms a key part of developing cancer expertise in the UK. The Christie has always been a leader in radiotherapy and is well known for developments in brachytherapy and hypo fractionation. More recently The Christie has played a leading role in the development of conformal therapy. The two satellite radiotherapy centres, in Oldham and Salford, were added in the early 2000’s and have established The Christie as a network leader in oncology. The Christie developed and implemented the first clinical multi- leaf collimator, was a leader in intensity modulated radiotherapy research and implemented the first clinical cone beam system for volumetric imaging of radiotherapy patients. More recently, The Christie has played a leading role in the development of conformal therapy. The two satellite radiotherapy centres, in Oldham and Salford, were added in the early 2000’s and have established The Christie as a network leader in oncology. The Christie offers reference support and second opinions to patients across the UK, and the Christie Medical Physics and Engineering service is now offering advice and support to hospitals overseas on implementing their own radiation oncology services. 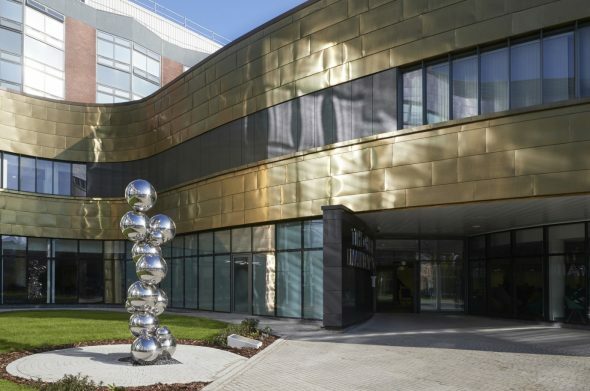 In 2016, The Christie NHS Foundation Trust was named the most technologically advanced cancer centre in the world outside North America, according to the Top Masters in Healthcare group, which painstakingly researched 100 top cancer centres across the world and ranked them according to the level of cutting edge technology available for treatment and diagnosis. The Christie was awarded 9th place in the world, and is the top centre outside of North America. The Paterson Institute, now part of the Cancer Research UK Major centre also on-site, is a dedicated internationally recognised cancer research institution that has been active in cancer research since before the appointment of its first full time director in 1962. 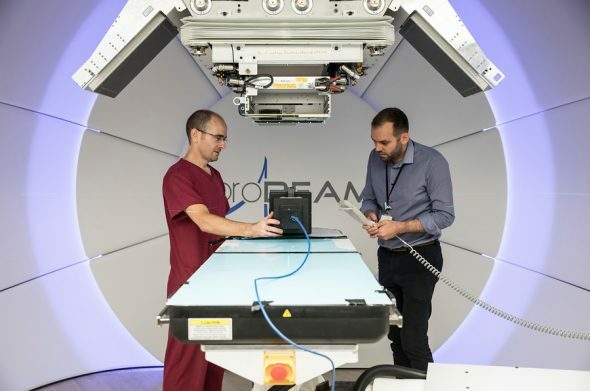 The forthcoming Proton Therapy Research Room will be the latest development in cancer research to be delivered at The Christie site and represents a collaboration between The Christie, The University of Manchester and Cancer Research UK. 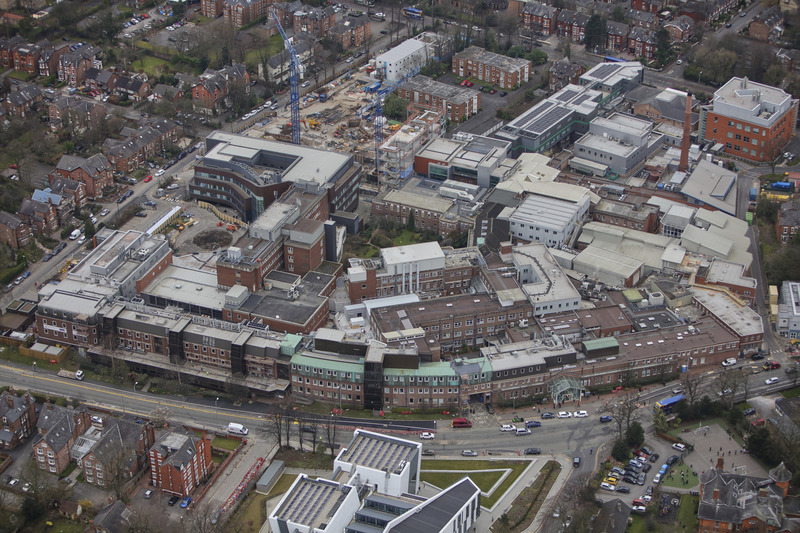 Current projects at The Christie include the installation of an MR-guided linear accelerator, and, of course, the first live site of the UK national proton therapy service. The Christie is a part of several leading national and international clinical trials, and has been named by the National Institute for Health Research (NIHR), as one of the best hospitals providing opportunities for patients to take part in clinical research studies. We are currently involved in development of several trials which will include Proton Therapy.